Our reflection of the psychic centres begins from ajna chakra. According to tradition, mooladhara chakra is designated as the first chakra since it is the seat of kundalini Shakti. However there is another system in which consideration and study of the chakras commerce from ajna . Ajna chakra is the point of the confluence where the three main nadis or forces – ida , pingala and sushumna , merge into one stream of consciousness and flow up to sahasradhara, the crown centre . In mythology these three nadis are represented by three rivers Ganga(ida) , Jamuna(pingala), and Saraswathi ( sushumna) . The convergence at a place called Prayyag or Triveni, which is near present day Allahabad in India. Indians believe that every twelve years, when sun is in Aquarius, if one takes a dip at the confluence, he or she will be purified. This place of confluence corresponds symbolically to Ajna Chakra. When the mind is concentrated at his conjunction, transformation of individual consciousness is brought about by the merging of the three great forces . Individual consciousness is mainly comprised of ego, and it is on account of ego that we are aware of dualities. As long as there is duality there cannot be Samadhi. As long as you remember you and you cannot get out of yourself. Although there are experiences of trance in the other Chakras, there is no merger of the individual ego with the cosmic ego. 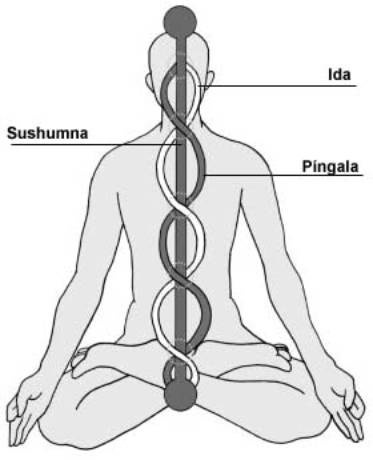 All throughout you find you are trying to assert yourself behind all the experiences you are having, but when ida and pingala unite with sushmna in ajna chakra, you lose yourself completely. By this I do not mean what you become unconscious. Your awareness expands and becomes homogeneous. The individual awareness falls flat and you completely transcend the realm of duality. Therefore, ajna chakra is very important centre , which you must experience in order to bring about purification of the mind. Once mind is purified, the experience and awakening of the other chakras can proceed. There is a certain problem with the awakening of the other chakras. Each of these chakras contains within it a store of karmas or samskara, which may be both good bad, positive and negative, painful and pleasant. The awakening of any chakra will bring to the surface and explosion or an expression of these karmas, and not everybody is prepared or ready to face them. Only those who are equipped with reason and understanding can cope. Therefore, it is said that before you start awakening and manifesting the great force, it is best to purify the mind at the point of confluence. Then with a purified mind, you can awaken all the other chakras. Therefore we begin our exposition of the chakras with ajna.